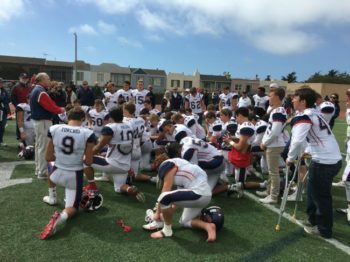 SAN FRANCISCO – Senior running back Noah Loeliger led the Campolindo attack on Saturday afternoon, as the Cougars defeated St. Ignatius, 35-14 at JB Murphy Field. Loeliger carried the offense from the beginning. The first play from scrimmage saw Loeliger break a few tackles and run 76 yards for a very early Campolindo touchdown. Loeliger continued to dominate throughout the game, rushing for 194 yards and three touchdowns. Loeliger’s second rushing touchdown came early in the second quarter. His short four-yard score extended the Cougars’ lead to 21-7. Late in the third quarter, Loeliger ran 17 yards for his third touchdown – and Campolindo’s final touchdown – to put his team up 35-14. Campolindo’s other two scores came on a 64-yard touchdown pass from senior quarterback Jacob Westphal to junior wide receiver Kevin Mossotti and a two-yard touchdown rush from senior Branden Bocobo. As for St. Ignatius, the Wildcats responded nicely to Loeliger’s opening touchdown, completing a 70-yard drive with a one-yard touchdown rush from senior quarterback Patrick Brosnan. Early in the second quarter, junior running back Henry Vatinel broke free for an 80-yard touchdown run to bring SI closer, 21-14. But the Wildcats’ offense was silent in the second half, as the Campolindo defense held them scoreless. St. Ignatius (1-1) travels to Marin Catholic (1-1) to play the Wildcats on Saturday at 2:00 p.m. Campolindo (1-1) plays Deer Valley (1-1) on the road on Friday night at 7:00 p.m.